My daughter's birthday is coming up at the end of this month. 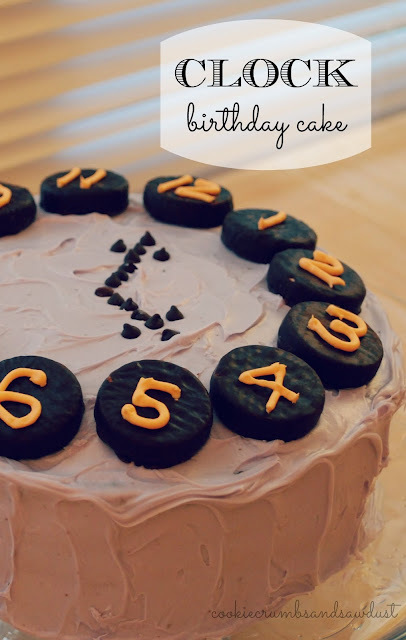 When I asked her what she wanted for her cake, she replied, "a clock cake!" Admittedly, its a bit of an odd choice, but hey, it's her birthday right? I made one for her 4th birthday a few years back. It came about after I let her browse my cake decorating book. It's suggested event is New Year Eve, setting the hands on midnight, but since she was turning four, we adapted it to four o'clock. With some frosting, peppermint patties, and mini chips, you've got an easy birthday cake! Prepare and frost you cake according to the recipe. I choose to do a two layer circle cake, making the peppermint patty placement super easy. Add a small amount of meringue powder to your frosting, according to the amount on the package. Meringue powder can easily be purchased at most craft stores in the baking section. Place the patties on a circle on your cake. Kids love to help with this step. Arrange the mini chocolate chips at the desired time. Use a toothpick to gently pre-mark the frosting if you like. This could be fun for a child's first birthday. Just arrange the time at the moment the baby was born. Substitute colorful mini candies for the chocolate chips. Substitute grasshopper cookies for the peppermint patties. This is super cute! What a fun idea for a cake!